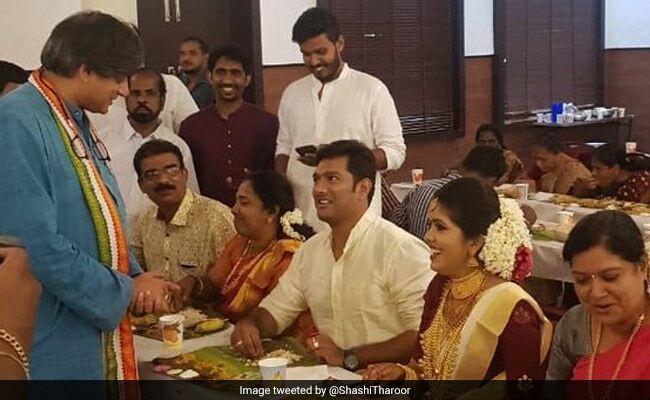 Shashi Tharoor shared his picture at a wedding function where he is interacting with a newly married couple as they are eating along with other guests. Election 2019: The couple and the guests are seen sharing a laugh with Shashi Tharoor. A cup of tea with an autorickshaw driver, a meeting with the royals, then a warm lunch with his mother-- Thiruvananthapuram lawmaker Shashi Tharoor, seeking another term from the constituency, had a busy Monday as he canvassed for votes in Kerala's capital for the April-May national election. The highlight of the day, however, was when he gatecrashed a wedding. Mr Tharoor, who is one of the most followed politicians on Twitter, shared some pictures of his day. He also shared his picture at a wedding function where he is interacting with a newly married couple. The couple and the guests are seen sharing a laugh with the lawmaker, known for his witty remarks. "No one is spared during elections- not even the groom and bride trying to get a quiet lunch when their MP comes canvassing for votes," he tweeted. Earlier in the day, Mr Tharoor met members of the Travancore royal family. Mr Tharoor, who won the Lok Sabha election for the first time in 2009, scraped through with a margin of around 15,000 votes in 2014. Challenging Shashi Tharoor in the national elections this time is BJP candidate Kummanam Rajasekharan, ex-Governor of Mizoram. He began as an activist in the Rashtriya Swayamsevak Sangh, BJP's parent organisation, and rose up the ranks to the Kerala BJP president in 2015. Mr Tharoor, however, is not worried. "I am inclined to think that my margin of win will be more than the last time," he recently told NDTV. The former diplomat over the years has emerged as a forceful critic of Prime Minister Narendra Modi and his government. His latest attack against the BJP had come last week when he accused the BJP of turning the polls into a khaki election. "We were doing very well by all estimations and the momentum was with us when the Pulwama tragedy struck us. Thereafter, the government has tried to make this a khaki election, a national security-based election," Mr Tharoor told PTI in an interview. "They are trying to hype their nationalist message that they were trying to protect the nation at the time of danger which, to my mind and my party's view, has not been the principle challenge facing the country," he said, adding that the elections should be fought on perennial issues, not on tragedy of one moment.